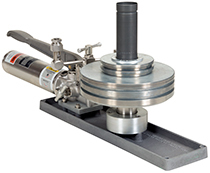 The Type T tester is a dead weight tester that offers laboratory accuracy in an instrument designed to withstand an industrial environment or daily stresses of a manufacturing environment. Each tester features a re-entrant type measuring piston and cylinder assembly. This design reduces the rate of fluid leakage and increases float time, helping to maintain accuracy as test pressures increase. • Small incremental weight sets available. A dual volume pumping feature allows a large volume of fluid to be added at low pressures to fill the system and increase pressure rapidly. Once filled, switch to a smaller volume to easy pumping and provide finer control at higher pressures.